Groundwater is the water located underneath Earth's surface in soil pore spaces. Groundwater makes up to 20% of the world's fresh water supply, which is about 0.61% of the entire world's water. Groundwater is a very useful and often abundant resource. However, over-use can cause major problems to human users and to the environment. 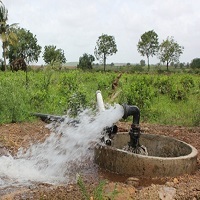 Groundwater is polluted when pollutants are directly or indirectly discharged into water bodies without enough treatment to remove unsafe compounds.